Isn’t it about time we got a little angrier and a little more scandalised? On 5 May we will troop up to the polling booths having endured four weeks of unfathomably banal soundbites, platitudinous drivel and vapid party political broadcasts — and we will do so because we believe it is our duty and because we have faith in the process. General elections and the whole notion of parliamentary democracy is as British as steak-and-kidney pie. We have it and many others do not, much to their disfavour. We trust it and we have implicit trust in ourselves not to abuse it. ‘Vote early, vote often’ is nothing more than a little joke, isn’t it? — unless you’re speaking from Harare or Chittagong or Kiev. Well, not this time, maybe. This time around we will be participating in an election which, simply put, has been loaded in favour of the government. Not just because it will take many thousands more voters to elect a Conservative MP than a Labour MP, of which more later. Almost without question, there will be frauds committed and again, almost without question, the overwhelming majority of these frauds will favour the Labour party. We all know this, the government knows this and has even accepted as much by signing up to legislation to make postal voting more secure — but only after the election has taken place. In other words, it will benefit from the fraud and only then maybe change the law. Isn’t that scandalous? Labour is treating the British ballot box with the kind of holiness and reverence one might expect of a bunch of Zanu-PF officials in some fly-blown corner of Matabeleland. If Robert Mugabe wanted to score an instant and hilarious propaganda coup against the ‘homosexual gangsters’ of the Blair government, he could do no better than to dispatch a team of election monitors to Britain to cover this election, and their first stop should be the Midlands. A week or so ago, as we predicted in these pages, a High Court judge, Richard Mawrey QC, concluded his investigation into postal vote fraud in Birmingham by disbarring six Labour councillors and stating that the current voting system was ‘an open invitation to fraud’. He likened the shenanigans in Birmingham to the sort of thing one might find in a banana republic and said that, without immediate action, there was no reason to expect that such sorts of fraud would abate. But the government — and the supine quango it appointed to monitor the safe and secure running of elections, the Electoral Commission — ignored his verdict. Indeed, the Labour party is pushing ahead with some of the very same practices that have made voting fraud so easy to get away with. All three major parties are urging their supporters to use the postal vote; but Labour’s urging is by some margin the most avid. Some 80 per cent of people who have a postal vote actually get around to marking their cross beside the name of a candidate, whereas the overall turnout last time (in 2001) was only 59 per cent. Postal votes disproportionately favour Labour because their vote is the softest, the most likely to stay at home (particularly this time around). This is no reason, by itself, to worry about postal votes, I suppose — although the Electoral Reform Society thinks people should only have a chance to vote by post if they are provably incapacitated or provably absent for election day, rather than simply because they are bone idle, indifferent or too stupid to find their way to the polling booth. No, there are plenty of other reasons to worry about postal votes. The fraud that occurred in Birmingham was perpetrated on an industrial and quite shameless scale by the local Labour party. The deputy leader of Birmingham City Council, a Liberal Democrat called John Hemming, told me it had been going on for years but had increased quite dramatically lately. A petition was got up against Labour in two council wards, but Hemming suggested there was systematic fraud in some 15 or 20 wards. It was intimated, locally, that Mr Hemming was paranoid: but the judge found him to be dead right. It is intimated by the government and the Electoral Commission that we are all paranoid, too. Fraud can take place anywhere, not just with postal ballots, the government tells us, blithely ignoring Richard Mawrey’s point that the current system is an ‘open invitation’ to fraud. The number of postal votes will have increased exponentially by 5 May: to give you some idea of the scale, more than 40,000 people in the constituency of Wakefield alone will be voting by post this time around. The potential for the sort of fraud perpetrated in Birmingham has therefore massively increased — and it is a signal point, too, that those areas with the highest take-up of postal ballots are those with sizeable Muslim populations, the very areas which have proved most susceptible to large-scale fraud. The Birmingham inner city, Blackburn, Oldham and Pendle (where Lord Greaves has fought a war of attrition to indict the local Labour party) are all areas with Muslim Labour councillors and a high population of Muslim voters. At the very best, you might say that the Electoral Commission has been complacent. At worst, it has abrogated its responsibility at the behest of its paymasters in government. It pronounced itself ‘gravely concerned’ at the events in Birmingham but its spokeswoman, Gemma Crosland, told me there was as yet ‘no widespread evidence of mass fraud across the country’. Oh, well that’s all right, then. To support this argument, she added that there had been only a handful of petitions citing fraud. But such petitions as occurred in Birmingham are hugely expensive and time-consuming — imagine the cost of a two-week civil action in the High Court and you begin to get some idea of the money involved. How many electors would be prepared to stump up for that? Gemma said she accepted that ‘public confidence’ had taken a knock of late and that therefore something needed to be done to reassure the public. But she rejected point blank Richard Mawrey’s assertions quoted above. The Electoral Commission knows a lot more about this sort of thing than a High Court judge, after all. According to them, the problem seemed to be one largely of ‘perception’ — in other words, the public have got themselves into a bit of a tizzy about all this, and while there’s nothing remotely sinister going on, we’d better put their little minds at rest. In truth, the Electoral Commission failed to see this coming and has subsequently failed to do very much about it. But the government won’t even sign up to all of the recommendations made by its own ineffective quango. The government seems to like the idea of the Labour party sorting out postal vote applications and, when the voter finds himself in a spot of bother, filling them in, too. And then sending them to the returning officer. That’s what happened in Birmingham. 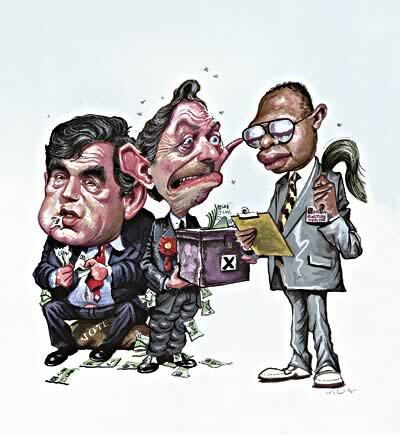 As far as the Electoral Reform Society is concerned, the Labour party has stalled and prevaricated at every turn, most noticeably in refusing to sign up to the notion that candidates (or party activists) should not handle postal ballot papers. Even now, its spokesperson told me, there is a Labour party election letter in Leeds North West requesting that postal ballot forms are sent back to the candidate’s office. Call me a cynic, but does that seem a safe and secure procedure to you? It’s not as if safe and secure procedures for postal ballots were unheard of, or difficult to put into practice. They’ve had them for the best part of four years in Northern Ireland, for example — perhaps because local opinion there is wise to the possibility or likelihood of postal fraud. So, why not here? It is difficult, looking at the government’s reaction to the events in Birmingham and elsewhere and its reluctance to take any immediate action at all, to form a conclusion other than that the party wishes to continue to prosper from the fraudulent actions of its aspiring candidates. All of the three main parties have what the police call ‘form’ when it comes to voter fraud — but it is Labour that has been the most spectacular and prodigious offender. And there is nobody to police postal voting: everybody seems to be agreed that it should be the returning officer who takes responsibility, but equally everybody is agreed that at the moment the returning officers are utterly incapable of doing so. You might agree with the Electoral Commission that it is all piss and wind, small-scale local stuff of no national significance. But remember that the postal vote has increased enormously, and imagine — perhaps with the aid of alcohol or soft drugs — that on polling day the parties are running neck and neck and that an overall majority might depend upon the result from Blackburn, or Leeds North West. How comfortable would you feel? Of course, for the Tories to run ‘neck and neck’ they would have to avail themselves of the services of a great many more voters than would Labour. This is the other reason the election is loaded, the reason I alluded to earlier. If both Labour and the Tories emerge on the glad morn of 6 May with 34 per cent each of the vote, then Labour will have 343 seats and the Tories will have 201. Mr Blair would remain in office with a nice majority of about 40 seats. To an outside observer — say, someone from the electoral monitoring unit of Zanu-PF — this would seem a bit of a paradox and even perhaps grounds for suspicion. In a fair system, on 34 per cent, Labour and the Tories would each have 272 seats. But not here. According to Peter Kellner, this is partly because Labour has had above-average swings in the constituencies where it matters most — but also because, as a result of the Boundary Commission, safe Labour seats consist of small electorates which enjoy lower turnouts. The Boundary Commission, Kellner suggests, always lags behind changes in the national demography. Which, again, is lucky for Labour. In the end, it takes 22,000 votes to elect a Tory MP and only 16,000 to elect a Labour MP. Within the next couple of days or so, the Office for Democratic Institutions and Human Rights, an offshoot of the Organisation for Security and Co-operation in Europe, will decide whether or not to bother monitoring our general election. Britain? It’s safe as houses, isn’t it? I suggested that perhaps they might like to swing by for a day or so. I wonder how they think we compare to Kiev.